Featuring a universal measurement input for resistance thermometers, resistance potentiometers, thermocouples and mV signals, JUMO Wtrans B transmitter model can measure temperature and liquid level, as well as other process signals. Its flexibility is underlined not only by the 24 retained resistance thermometer/thermocouple characteristics, but also by customized linearization with up to 40 value pairs or by the use of a 4th order polynomial. The associated setup program for configuring the wireless transmitter has a function for automatically determining coefficients for the customized linearization. The Wtrans B transmits the acquired process signal over the 868.4 MHz of the unlicensed ISM band and achieves a free-field transmission range of up to 300 m. Including an RS 485 interface, the wireless transmitter can be rapidly integrated into the Wtrans receiver system, allowing measurements to be taken in physically or economically difficult to access places. 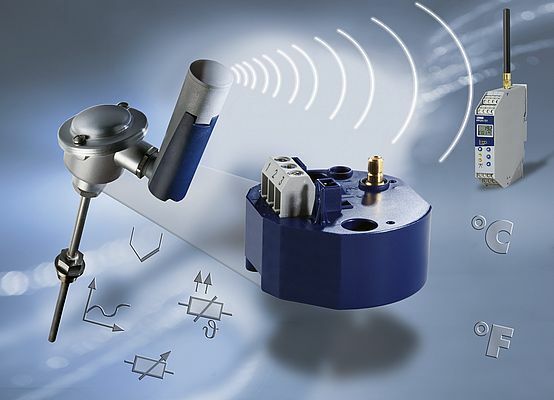 The compact, mechanical implementation of the wireless transmitter with its totally encapsulated electronics and screw-in antenna housing with integrated battery compartment, is housed in a sturdy, industrial design with IP 65 protection. It can be quickly and safely mounted for use in a DIN terminal head of form B or larger. Thanks to the standardized 20mm screw fitting of the antenna battery housing, it can also be installed in many other mounting devices. A wide range of operating temperatures from –30 °C to +85 °C ensures that the transmitter can be used and operated faultlessly under adverse environmental conditions. The setup program’s online chart option provides for simple visualization and online recording of the acquired process values.